The Jolly Sportsman, is a beautiful, old country pub and restaurant located in East Chiltington in the South Downs National Park near Ditchling. It’s location makes the journey an outing in itself, but I can honestly say that it is well worth the drive, and I will certainly be making an effort to visit there again. In the daytime, the pub has a beautiful, outdoor area, in a lovely garden with the countryside as a backdrop. We visited in the evening, where it’s warm, cosy interior and roaring fire welcomed us in from the frosty night. The best way to get to The Jolly Sportsman is by car, or if you have a bike, it would make a nice Sunday ride, or, as my extreme running friend said – it’s a perfect place to run to! There are directions on their website, and if you have a navigation system in your car then that would be best. I wrote some notes on the way there to help others find it, so please see them at the bottom of this post, so I hope they will help! I visited on a Friday evening with some friends who had never been before either, but we had all heard really good things. It’s mentioned in the Michelin Guide, and also the Good Pub Guide, who speak about the quality of the food and the value for money. It was pitch black when we got there, but I noticed a garden to the right of the car park as well as a greenhouse, which implies that they must grow some of their own herbs or veg. We were welcomed as soon as we walked inside, and the other waiters were greeting other diners like they were all regulars – there was a really nice atmosphere about the place. The bar itself is quite small, but the seating area for the restaurant is large, with plenty of tables spread out throughout. The interior felt like you were in someone’s lovely home, with wooden furnishings, comfy armchairs, candles, lamps and picture frames on the walls. They had homemade chutneys, pickles and olives for sale in jars on the shelves too. The menu is exciting, with classic English country pub dishes, using locally sourced, seasonal ingredients but with technique and skill that makes their food stand out above the rest. 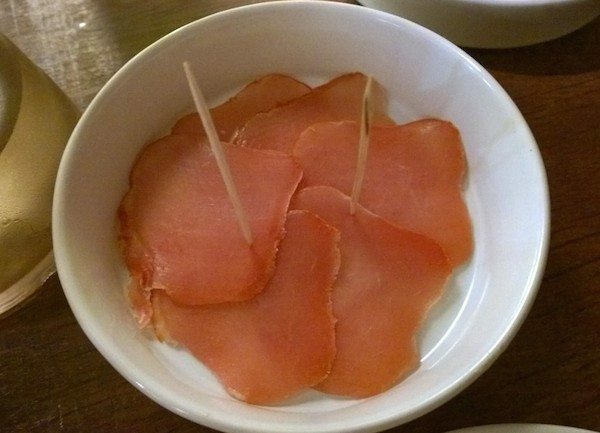 They have homemade charcuterie, and small dishes for snacking, a handful of starters and a good selection of main dishes with something for everyone. There are a range of delicious fine wines to choose from, as well as local Dark Star and Harvey’s beers, straight from the cask. We decided to have a couple of tapas style snack plates to share to start with, as they sounded intriguing and we couldn’t resist. We were asked if we would like bread as well, which was lovely and fresh and homemade. We ordered the pork loin carpaccio, and haddock popcorn as they both sounded different – something we had never had before. The pork loin was salty, very tasty and melted in your mouth just the way you would hope. The haddock popcorn came as small morsels of crunchy, flaky fish, and came with a strongly curried mayonnaise to dip them in. To drink my friend and I shared a carafe of the Italian Trevianno, with notes of honey and almonds, it was lovely and light and went well with our sharing plates. 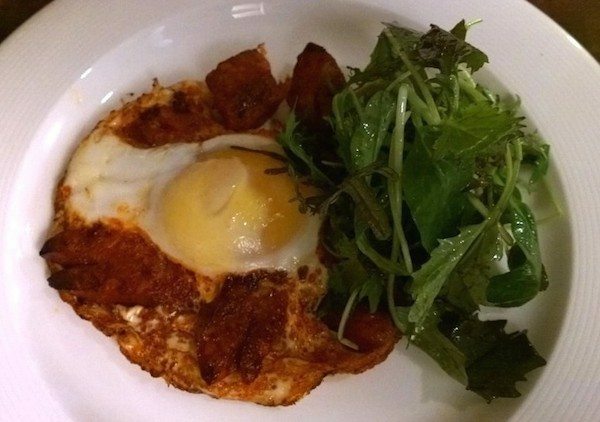 Our first courses came out just as we were finishing up, and just to warn you, the portions are very generous! I had the squid ink risotto, my friend had the haddock tart, and her partner went for the baked duck egg with chorizo. 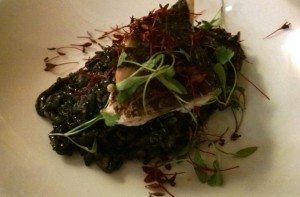 My risotto was cheesy and creamy with chunks of tender squid running through it and had a charred fillet of perfectly cooked silver mullet and micro herbs on top. Each mouthful was a pleasant experience, and I didn’t want the dish to end! The haddock tart came as a large slice, and was topped with a perfectly soft poached egg, hollandaise sauce and some more of the crunchy haddock popcorn. 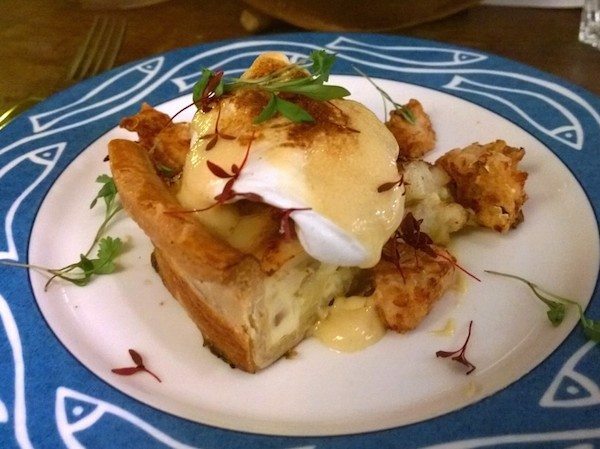 There were firm chunks of haddock inside, and the pastry was buttery and well made. The chorizo was baked with the duck egg surrounding, the yolk was still runny and there was a lovely lentil salad on the side. We were all really impressed with the food so far, and were looking forward to tasting our mains! For the mains, my friend and her partner ordered from the specials board, one having the steak with triple cooked chips, and the other went for the coq au vin. 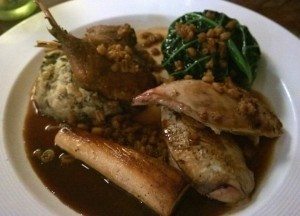 My choice was the Piddinghoe Partridge breast and leg, and it came with savoy cabbage and bacon lardons, parsnip root, braised pearl barley and a creamy haggis mash. The partridge was really tender, they really did get the cooking time spot on! The legs were crispy, and tasty, and the haggis mash was really good, it was a plate of warming comfort food and I thoroughly enjoyed it. 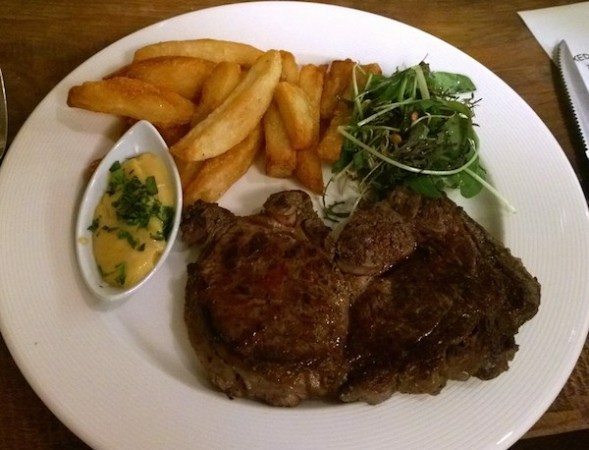 The steak that my friend had was melt in your mouth, with a smoky, chargrilled flavour and cooked just as he asked for it – medium rare. The chips had a thick, crunchy coating, and were fluffy inside, not too thick, exactly how you want a good chip to be! 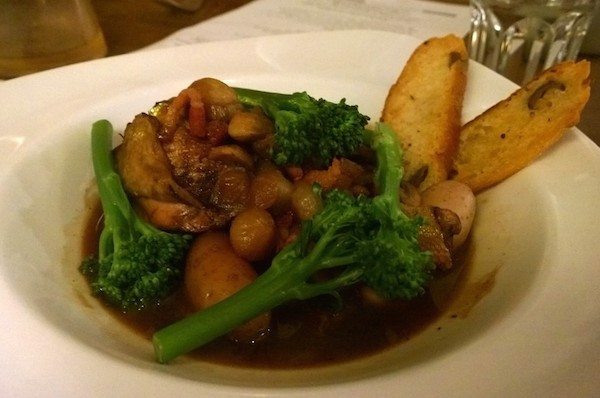 The coq au vin’s red wine sauce had a good depth of flavour, with sweet, tender stemmed broccoli, smoky bacon lardons, baby onions, button mushrooms and two large pieces of juicy chicken. The food was flawless, and some of the tastiest that any of us had had! The dishes were simple, but because all of the ingredients were of top quality, and they were cooked so well, they were amazing. As the portions were generous, we were all quite full, but as you know, there is always room for dessert. 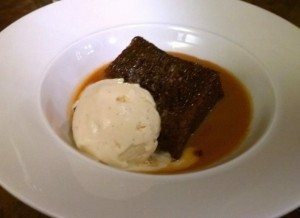 We all shared a cheese board, made up of local cheeses, fruit and homemade chutney, as well as a warm gingerbread cake with a hot toffee sauce and creamy vanilla ice cream. The gingerbread cake was one of the highlights of the evening for us, it was spicy from the heat of the ginger, it was dense and moist, and the toffee sauce around it was sweet and very good. We all decided that we wanted to come back for the sole purpose of eating that dessert. And to try other menu items of course! 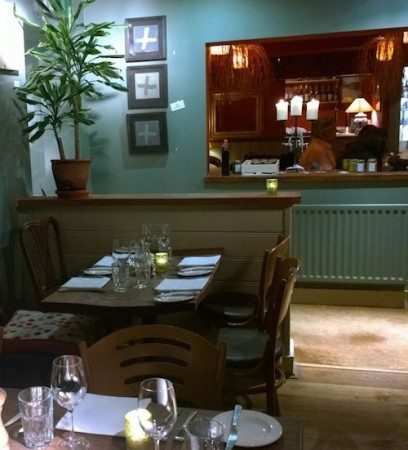 Looking back on the prices, the menu is very reasonable, with starters costing around £7 each, and mains between £12 – £18. With the sizes of the portions, and the quality of the ingredients and preparation..
..it is definitely good value for money, and well worth the trip outside of the city. If you love country pubs, and you love good food, there is no reason why you shouldn’t visit The Jolly Sportsman while you are in East Sussex. I am looking forward to going back in the summer to enjoy the garden and country surroundings, but I think I will have to fit in another trip in the winter too! Here are my directions when coming from Brighton, we came from London road area, but you could also head straight up Lewes Road, as I think it ends up meeting around the same place. Head up London Road on the A23. -Turn left onto the A273 towards Hassocks, and a little further on take a right towards Ditchling. -When you reach Ditchling, keep following the road round, then take a right at Ditchling roundabout past the sign to Westmenston. -Keep following the narrow windy road, pass Plumpton on the left and The Half Moon Pun, and about 2 minutes after that there is a sharp turn and a tourist sign with East Chiltington and The Jolly Sportsman written on it. -You will turn onto a narrow, one way road, and after another couple of minutes you will see a sign for the church which comes up on the right, and the car park for the Jolly Sportsman is just after that on the left!